As yet another round of plans are released for the 40-year-old landmark, the Astrodome, I can't help but wonder if it's time to implode the dome. The Houston Chronicle reports that the latest proposal would transform the former Eighth Wonder of the World into a 1,200-room convention hotel with a winding indoor waterway. It also calls for trees, walkways and mill wheels. The project even has a theme, the Best of Texas, which would feature buildings that evoked the state's past. 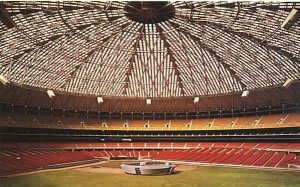 Developing the Astrodome into something useful is without argument desirable. After all, it costs Harris County about $1.5 million annually just to host a few events there. But the Astrodome is located in a boring part of the city with only the Six Flags Astroworld and Reliant Stadium--home to the NFL Houston Texans--to offer for itself. An NFL season is comprised of 8 home games, and the theme park is open for only three months in the summer. Who exactly would this monstrosity attract? Not a lot of businessmen. Downtown Houston is 10 miles north. Instead, the Astrodome Hotel will attract a few in-state tourists who between the theme park and their hotel rooms will wander aimlessly around replicas of the Alamo, state Capitol and a historic Texas courthouse before the place goes crashing into bankruptcy. A columnist for the Chronicle argued it would spell certain doom for the George R. Brown convention center and downtown hotels. But I don't see it. Would you host your conference miles away from any city attractions or good restaurants? The Astrodome is a landmark, and no one wants to see it demolished. Least of all me: I've been a faithful Houston Astros baseball fan for over 10 years. But if the county can't come up with something better than a convention hotel, it's time to implode the dome.